If you’re my regular reader, you’ll have noticed all (nearly) my blog headings are music titles. I have a huge, though some would say quite narrow collection of stuff to draw from, and it’s seldom hard to come up with something apposite. Usually, with me, it’s the case that the title is about the last component of a blog – the thoughts and content nearly always come first. Today’s different, though. The song was in my head, and I began to realise how appropriate the words had become. I’ve tweeted a fair bit about the journey I’m on at present, but only found time, inspiration or wifi connection, to blog here and here. To bring you up to speed, I had almost a month in my beloved Dolomites, and I am now nearer home, stopping over in Chamonix for a week. This was an accident. When doing the planning and original booking, I flipped over two diary pages by mistake. When I came to review the itinerary, after having made some of the accommodation and return travel bookings, I discovered I had a one week “hole” in the trip. That slip-up was rectified when I found that the lovely flat in Chamonix, that I rented for five weeks at this time last year, was available again for exactly that accidental week. Made to be. Right now? Very empty. Hotels, other guests, communal breakfast rooms, etc all provide a veneer of companionship when you’re a solo traveller. Self catering, in a nice, but nevertheless anonymous third floor apartment, throws you back on yourself, makes you reflective, and vocalises that inner dialogue. That’s a posh way of saying I talk to myself and to my furry travelling companion, of course. There’s a great freedom in not having to get up for a predetermined breakfast time, etc, but the added overhead that, if you want it done, you’re going to have to do it yourself. No one to replace your towels, make your bed each day, etc! On the up side, I can have a cup of tea made with properly boiled water, though. I’d been craving that for a fortnight. Most French supermarkets here have an “Anglais” section (though why no German, Italian, or Japanese one?) and I’ve even been able to buy Tetley teabags! Until last year, I hardly knew Chamonix. I’d stayed a few days here and there, and stayed quite nearby. Like it to me, I was a stranger. Visit somewhere often enough and your face gets known. I feel privileged that there are places in the Dolomites where I have become recognised as a regular. Not so in Chamonix. I felt very familiar with the place when it came to going home time last year. There was physical pain in that parting, if I’m honest. That’s why it’s so good to be back, even for a far shorter stay. But to Cham, its people and shopkeepers, I’m still just another nameless white face. Very true. I have a week when I’m finished here, before I’m due on board Le Shuttle. I left the details of that week empty, save for the Channel crossing date, and I was sure that “something” would occur to me in the preceding six weeks with which to fill the days. Well, not yet, it hasn’t. It’s probably down to having too much choice (lucky me). Unfortunately, I’ve been beating myself up about not spending longer in the Dolomites. Too far away now to go back there again before heading home, sadly. I expect something will turn up. Maybe I should insist to myself it be somewhere new? I’ve been interested in First World War history for many years now. I’ve occasionally blogged about it here, too. However, in all that I’ve read about, and of all the WW1 sites I’ve visited in Europe to date, the American experience of that war hasn’t really featured. Until today. Recent events regarding Syria have reminded me of that all too common joke about the USA being keen to be first into the next World War, to make up for being late for the last two. It was 1917 when the American troops joined the struggle against the Kaiser. What I’d not realised was the extent of the US dead, nor the short time-frame for the annihilation of so many soldiers. Until today. On my journey through France, the first leg of my trip out to the Dolomites in Italy, I left Reims this morning, without much of a plan in mind, except that I needed to be in Baden-Baden, in Germany, in the evening. My meandering route eventually took me north of the French “war and peace capital” of Verdun, to the area known as the Argonne. This is wonderful, wild, wooded and rolling country of immense beauty. In 1917 it was a key strategic gap in what we now call “The Western Front”. Unless protected, it represented part of the shortest German “bee-line” to Paris. The US “Doughboys” were poured in. I ended up at the Meuse-Argonne American Cemetery. This would actually quite hard to find if you were looking for it (I wasn’t, to be honest) and it’s still the largest American burial-place in Europe. Bigger than anything from WW2. You can read more here. The size of the place, and its simplicity, was overwhelming. Regardless of colour or status, every soldier here has the same white marble cross (or Star of David) bearing name, rank, home State, and date of death. So, so many had died in October or November 1918. The crosses cover such a large area it’s almost impossible to do them justice with a photo at ground level. I was there around midday. It was sombre as the cemetery chapel clock struck twelve, but I was completely reduced to tears by what followed. The chapel chimes played “The Star Spangled Banner” and then “John Brown’s Body”, or The Battle Hymn of the Republic, as the tune is properly known. Nothing could be more fitting for this place. I spent almost two hours wandering amongst the crosses. The names alone were a flavour of America, with Italian, Greek, Slav, Irish surnames, and many more. 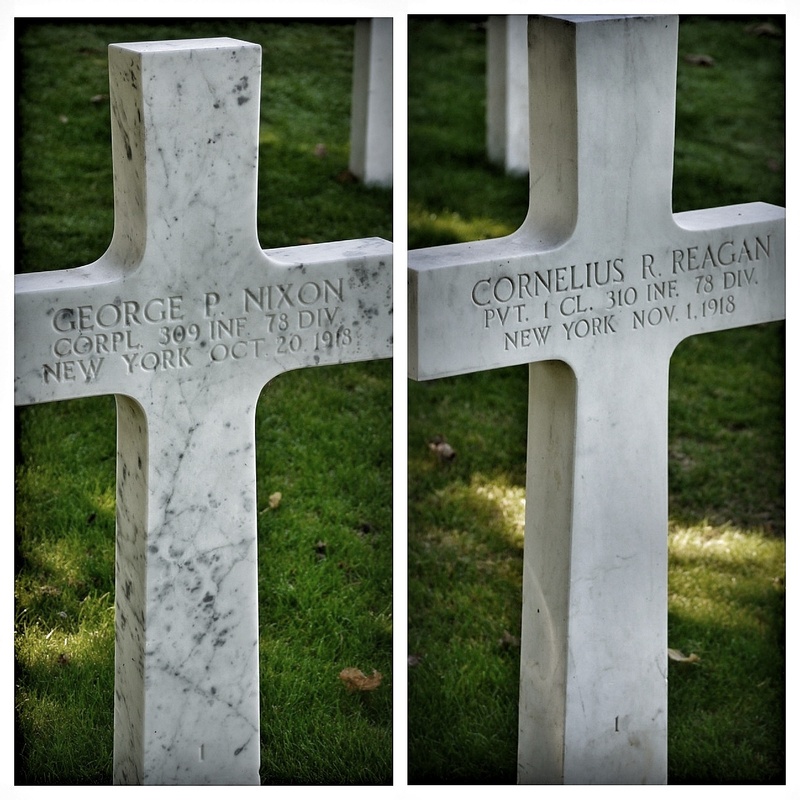 In one sector, I found a Reagan and a Nixon buried almost side by side. I found a Patton too. Wonder if any were relatives? The names alone brought it home to me, in the way nothing ever has before, that this was a World war. And the world was fighting itself. I felt truly chastened as I left. The stereo came on a mile or so down the road, with the CD tracks set to random play. First up was Leon Russell’s inimitable 1971 track “Stranger in a Strange Land”. That’s exactly how the American soldiers must have felt. 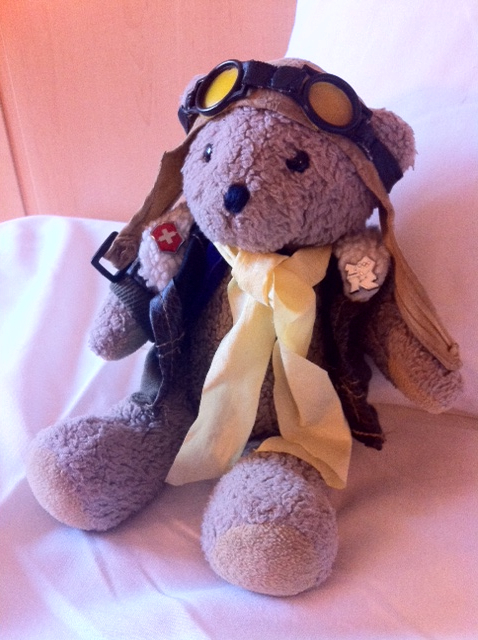 So, we (as in me and my small furry travelling companion) are on our way at last. The last 36 hours or so have been busy. Yesterday was completely given over to taking part in the Southern Masters League Final at Ashford. It’s the event I rate for quality and competitiveness above all Masters track and field events in the UK save for the BMAF National Championships. My club has qualified for the Final pretty much every year of the competition’s 25+ year history. Basically, the Final brings together in a full-on day of competition the eight top Club Masters Athletics squads in the south of England. When team manager of my mob, I was proud to lead them to win the match twice -last time being in 2012 – and gutted in 2011 when we lost by one single match point. I feel equally gutted for my successor as manager, Les Roberts, because history repeated itself yesterday, and Southampton AC beat us by just one point. For me, it’s had me wondering what might have happened if my dip finish in the 100m had been more effective, or if I’d not nearly fluffed our last relay baton change. Others too, I expect. But that’s sport, and great sport it was too. Those things aside, on a personal level, the match was good. I ran my fastest 200m of 2013, a forgettably slow 100m, and a fast sprint relay leg (though the less said about baton changing, the better). What was strange was that the 200 was into a headwind, while the 100 had a tailwind. That will perhaps sound unusual to anyone who doesn’t know the track at Ashford! I got through the day without injury or additional niggles, though I’m sore and tired now. Competitive season over for 2013. I guess it went pretty much to the optimistic version of “the plan”. Thank you to all who helped that happen. At dawn today, we were off down to the Channel Tunnel and over to France by the time civilization was having breakfast, on the first leg of the Big Trip. The first part of the journey was directly into the rising sun, and emblematic of my hopes for the next few weeks! To be honest, it was always going to be a “make it up as you go along” day today, because our destination was only three hours direct drive away, and we had much longer to kill. I’d programmed the GPS with a couple of waypoints. One of these was “Avesnes”. What I’d not checked properly was which “Avesnes” I’d picked, and yes, we were miles into deep rural French countryside before it dawned on me it was the wrong one of, as I found out later, several. Nonetheless, we got to see some fine country, and drive some brilliant, quiet roads, and we turned a 180 mile journey to Reims into one of over 245 miles! Part of me doesn’t think a big trip like this has properly begun until I’ve tasted the first Pelforth Brune, the signature beer of northern France. Well, I have now, twice, as it happens, so I’ll write any typos and grammatical errors off to “6.5%” and start planning tomorrow. You are currently browsing the Blog from a Faster Master blog archives for September, 2013.